Reportedly, the actor will play a travel agency owner who helps Khan's character. 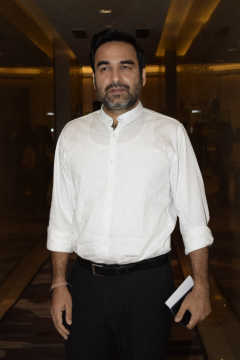 Actor Pankaj Tripathi has confirmed that he will be on board Dinesh Vijan's upcoming production Angrezi Medium (2020) for a cameo. The film stars Irrfan Khan and Deepak Dobriyal as sweet shop owners in Udaipur. The Hindi Medium (2017) actor is returning to Hindi films after a year, following his treatment in London for neuroendocrine tumour. Tripathi told Mid-Day.com that he agreed to be a part of the project because of Khan. "It is my love and respect for Irrfan and my friendship with Dinoo [Dinesh Vijan] that made me say yes," he said. The two National Award-winning actors will be working for the first time in Angrezi Medium, directed by Homi Adajania. Reportedly, Tripathi will play a travel agency owner who helps Khan's character get his daughter get to the UK. A few days ago, actress Radhika Madan confirmed her involvement with the project by sharing a photo from the Udaipur sets. She hinted that actress Kareena Kapoor Khan was also a part of the film, but the makers have not officially announced the casting of either actress as yet.